Do you have Georgia on your mind? We don’t blame you. The state, home to just over 10 million people, has a lot to offer. Let’s take a closer look at the cost of living in Georgia, including basics like housing and extras like sports tickets. Of course, your cost of living will depend in part on the city you choose to live in, but there are some significant statewide trends, too. Home prices in Georgia vary widely by location. In Atlanta, the average listing price is $420,196, according to trulia.com. In Augusta, Georgia the average listing price is just $114,324. 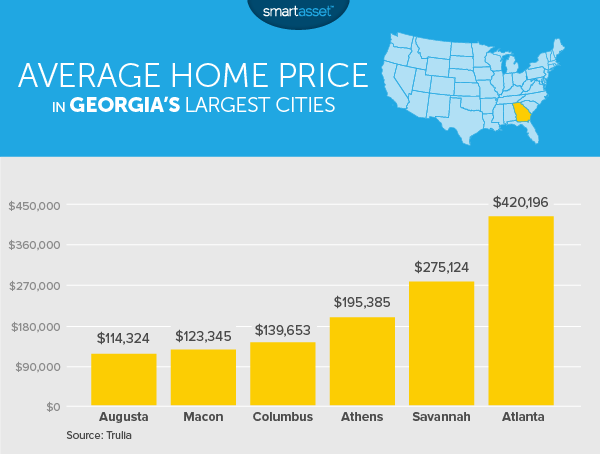 Check out the chart below to see how home prices stack up in the Peach State’s largest cities. Still on the “rent” side of the rent vs. buy decision? We have some good news for you. With the exception of studio apartments, apartments in Georgia rent for less than the national average. According to myapartmentmap.com, the average rent for a studio in Georgia is $1,290, $235 above the national average. From there, things get more affordable. The average rent for a one-bedroom apartment in Georgia is $908, which is $92 below the U.S. average. A two-bedroom apartment in Georgia has an average rent of $1,030, a full $200 below the national average. If you need three bedrooms in Georgia, expect to pay around the average of $1,176 per month. That’s a full $356 under the U.S. average rent for a three-bedroom. According to the U.S. Energy Information Administration, the average monthly utility bill in Georgia is $134.14. That’s 17.5% above the national average. Georgia’s average monthly utility costs put the Peach State in the middle of the pack relative to its neighbors. The Georgia average is higher than Tennessee ($132.76) and Florida ($129.86) but lower than South Carolina ($147.74) and Alabama ($145.25). Prices for groceries in Georgia are slightly above the national average. The Missouri Economic Research and Information Center’s cost of living analysis gives the cost of groceries in Georgia a score of 101.9, compared to the national average of 100. Index scores on grocery prices in the 50 states range from 85.4 in Idaho to 157.5 in Hawaii. According to Feeding America, Georgia has a food insecurity rate of 18.7%. Georgia is very much a driving state and traffic in the Atlanta metro area is notoriously bad. Atlanta residents also face the longest commuting distance of the 96 metro areas the Brookings Institution studied for its recent report on Americans’ commute to work. Atlanta residents commute an average of 12.8 miles to get from home to work, with an average commute time of over 27 minutes. What about gas prices? According to gasbuddy.com, the average price of a gallon of gas in Georgia is $1.893. That’s around 5% under the national average for a gallon of fuel. To obtain or renew a Georgia drivers license you’ll pay $20 for a license good for 5 years, or $32 for a license good for 8 years. Georgia has a progressive income tax system. The Peach State’s top marginal tax rate is the nation’s 20th highest, while Georgia’s bottom marginal tax rate is the 15th-lowest state income tax rate. Rates range from 1% to 6%, with a bracket for every number in between. Any single filer with income over $7,000 will pay that 6% rate. As for property taxes, they’re on the low side in Georgia. The median annual real estate tax payment in Georgia is around $600 less than the national average, at $1,425. Property tax rates vary by county, with a range from 0.44% to 1.29%. According to Castlight Health, the average price of a preventive primary care visit in Atlanta is $154. Prices range from $98 to $379 and rose 5% between 2014 and 2015. What about health insurance premiums? The second-lowest-cost Silver plan on the Health Insurance Marketplace in Atlanta costs $254 for 2016 coverage. That’s down 0.4% from 2015. If you’re looking for a top-notch financial advisor in Atlantic, check out our top-10 list here. There are plenty of great places to get a college education in Georgia. Prices vary widely, though, depending on whether the institution is public or private. 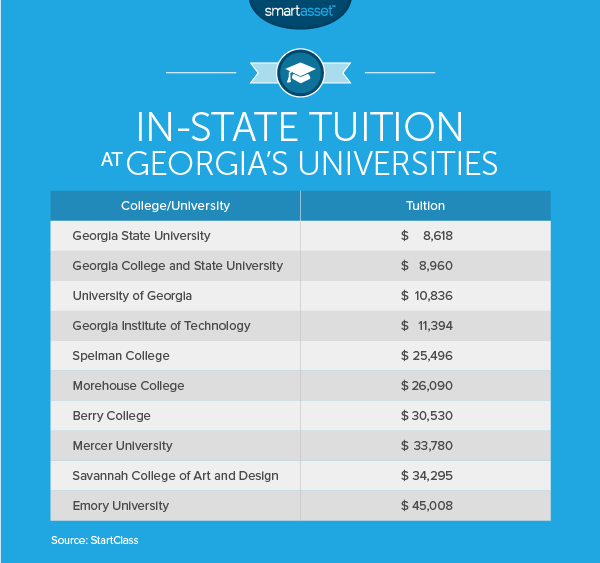 Check out the chart below to see how in-state tuition compares at some of Georgia’s finest colleges and universities. There’s more to life than just covering the necessities, right? 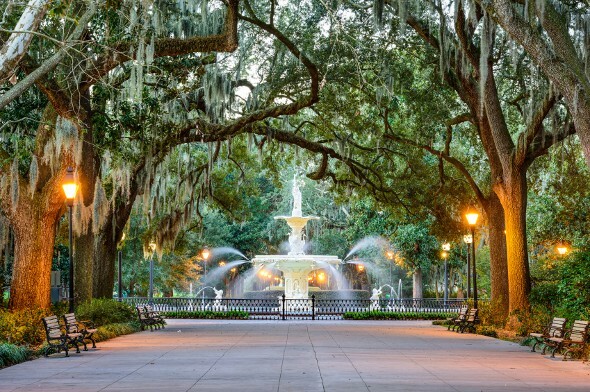 Here’s what you should know about some of the extras that enrich life in the Peach State. The average ticket price to see the Atlanta Falcons play professional football is $79. If that’s too steep for you, you can catch a Braves baseball game for just $21. Prefer basketball? The Hawks have an average ticket price of $39. If you prefer history to sports you can visit the Martin Luther King, Jr. National Historic Site free of charge. If you’re thinking about moving to Georgia, it can be helpful to know how the change will affect your budget so you can plan accordingly. If you’ll be starting a new job, your paycheck may end up looking quite different than it does now. Try using our Georgia paycheck calculator to estimate what your new take-home pay will be.